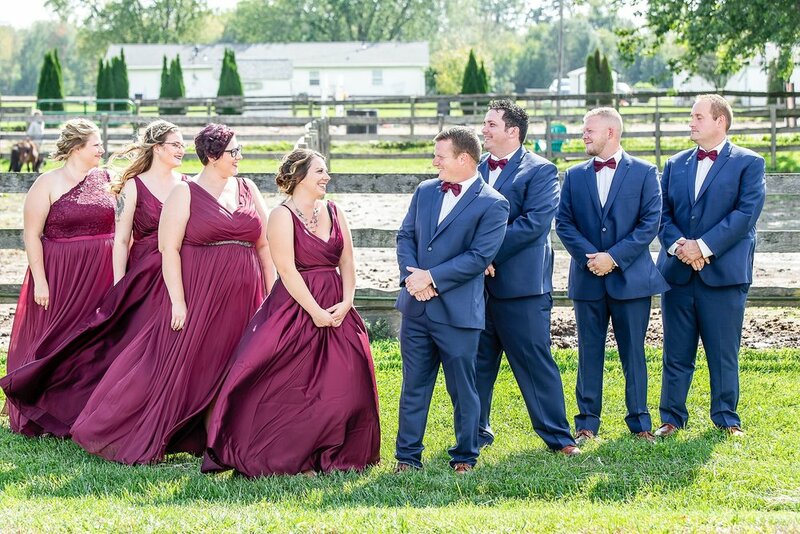 On one of the most lovely days in October, Jen and Blake were married at Crown Haven Center in Russiaville, Indiana. The weather, at least to begin with was far less scorching than most October days and when I arrived, I briefly ducked in to say hello to the bride and go see if the boys were ready for the prep images. I’m glad I stopped in with the first because I ended up setting down all my gear to help set up and prep the tables instead. Due to the intense rains of October monsoon season in Indiana (is that a thing yet because seriously…) they weren’t quite able to get everything up during our scheduled prep times. 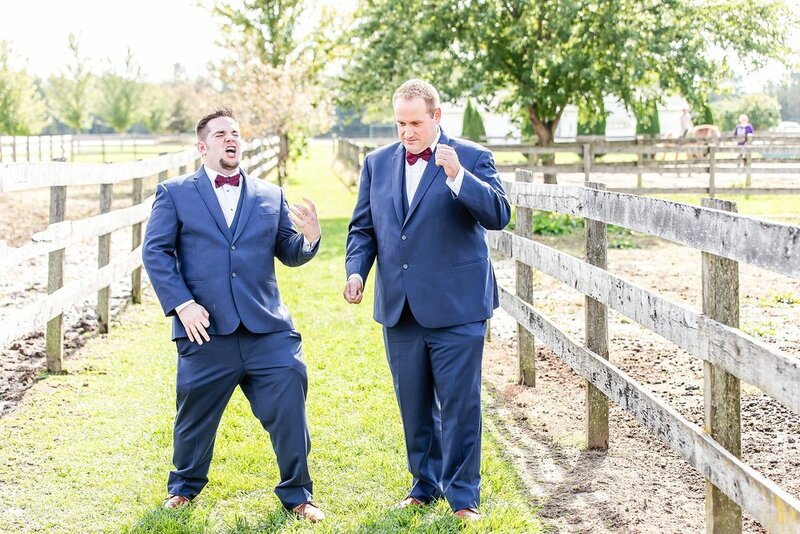 So, a little elbow grease and a lot of sweat later, we were able to head back to the barn, have the boys clean up and change, and get some excellent images. Joined by their family and friends, Jen, Blake, their two children, and all of the family and friends came together through mud, beautiful sun, and then an intense storm that had us all running for shelter before we were able to venture back out for a few more portraits. 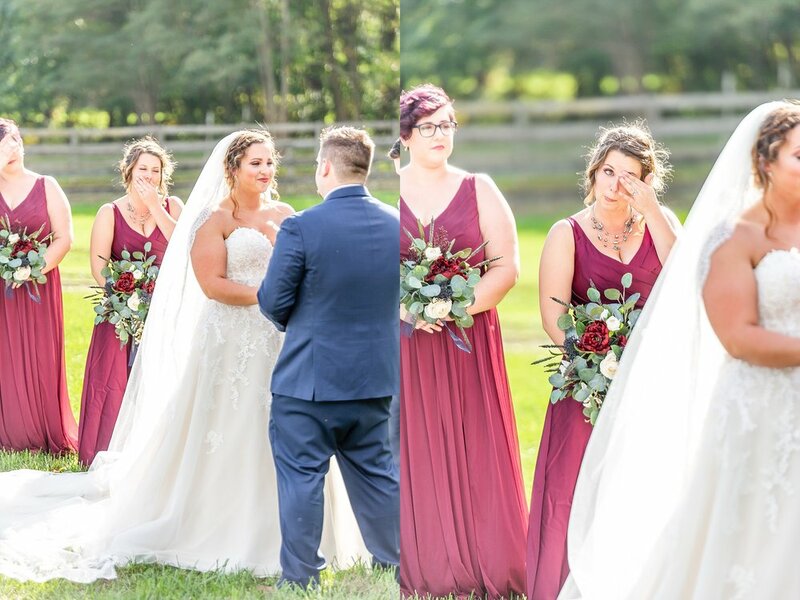 Jenna’s father and step-father may have had one of the best reactions to seeing her in her wedding dress (you’ll see below) and as I look through these images and was editing them, I found myself feeling emotional as well. What I absolutely adore about this couple is that the entire crew that joined them that day were supportive, loving and absolutely a dream to work with and in between the bits of silliness and sass that was very strong with this crew, they made Jen and Blake’s wedding day the best. 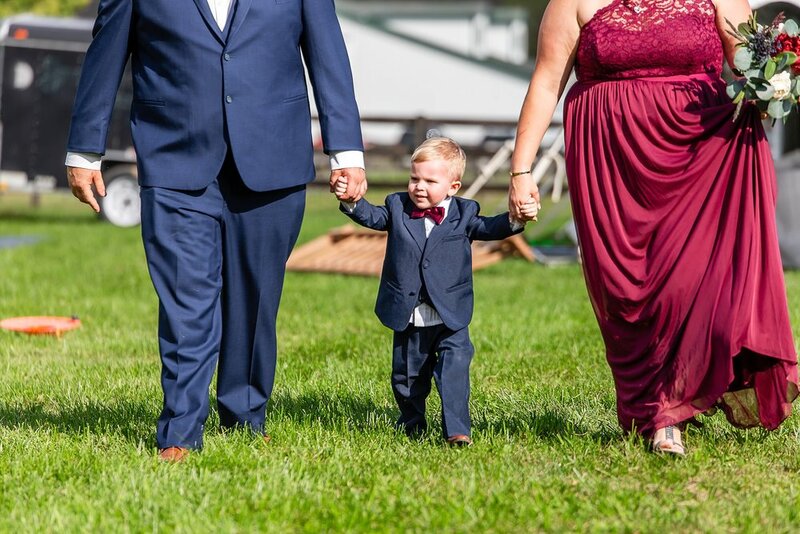 Even though there were monstrous monsoons, sinking tables (thanks to the mud prior to the wedding) and a few stuck vehicles from the night before, this wedding couldn’t have gone better. 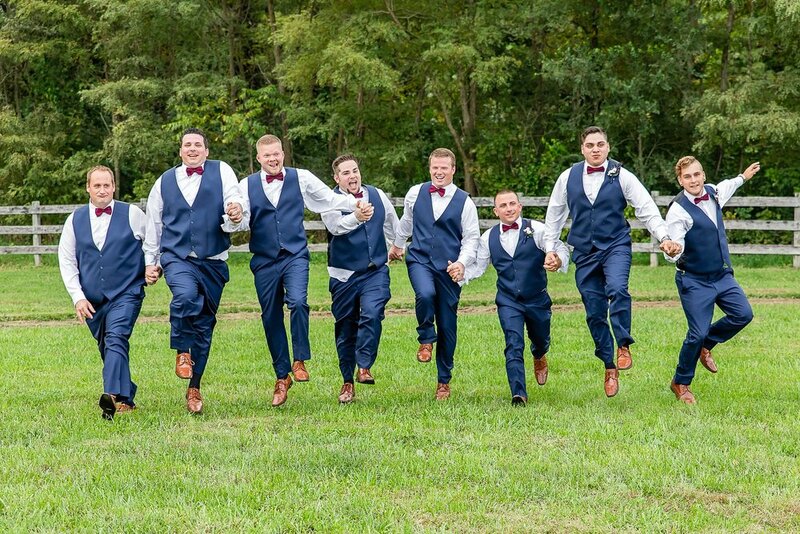 Jen chose beautiful details for her wedding and put Blake and the other gents in very handsome suits. Jen also made her own bouquets which flattered and evoked even more cozy thoughts of fall. 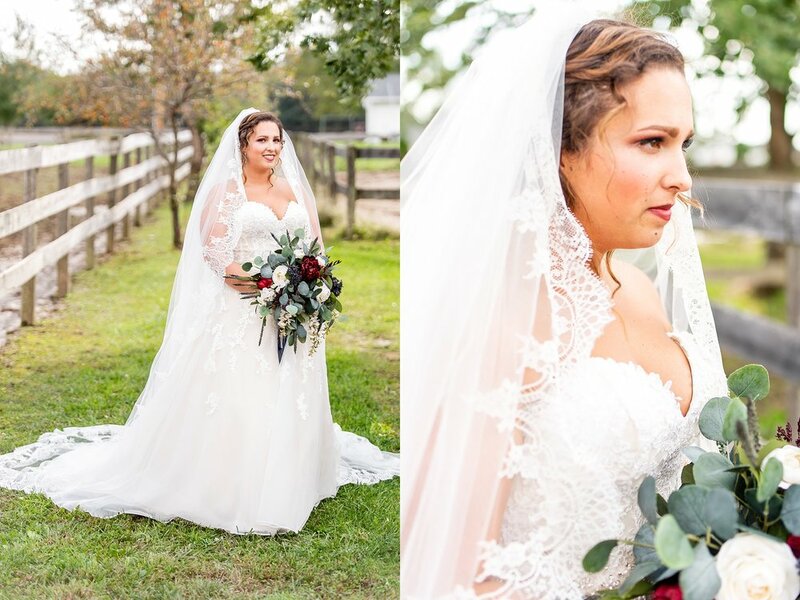 Another stunner detail that she chose was the cathedral veil that certainly came to life prior to the ceremony during our bridal portraits. All I can say is that I am so glad that it was well pinned. I am also surprised that she didn’t take flight as some of those gusts plus her veil could have certainly landed them an early honeymoon somewhere over the rainbow. Enjoy this beautiful wedding and this extravagant couple. I am so grateful for them and look forward to delivering the full gallery to them.